More than 97 percent of Grambling State University students receive some form of federal and state financial aid. With big debates around financial aid programs, TOPS, and overall funding in higher education, bottom-line support for students is critical in helping them reach their educational goals. 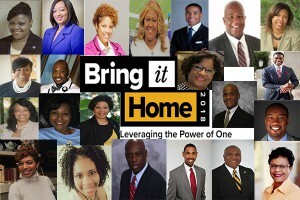 At Grambling State, our “Bring it Home” annual fundraising campaign helps meet students at their point of need – from scholarships to funding solutions for deferred maintenance and employee development. The campaign’s $1 million goal is one of many University efforts to help close the gap between graduation for students. “If the state can’t supplement it, mother and father, church or scholarship organization who does it? Somebody has to step up to the plate to make it happen and Grambling State is doing that.” According to Marc Newman, Vice President for Advancement, Research and Economic Development. As the second year of the campaign heats up, it does so with a team of leaders across the country who are helping “Captain” this year’s efforts. Grambling State University would like to thank this year’s Bring it Home Captains – who are leading the charge across the nation. If you would like to host a Bring it Home fundraising event or to contribute, you can contact advancementservices@gram.edu or contact any of our captains. Thank you to all of our captains and supporters for helping drive another year of success as we help #BringitHome2018. This entry was posted in Uncategorized on September 26, 2018 by Jovan Hackley.